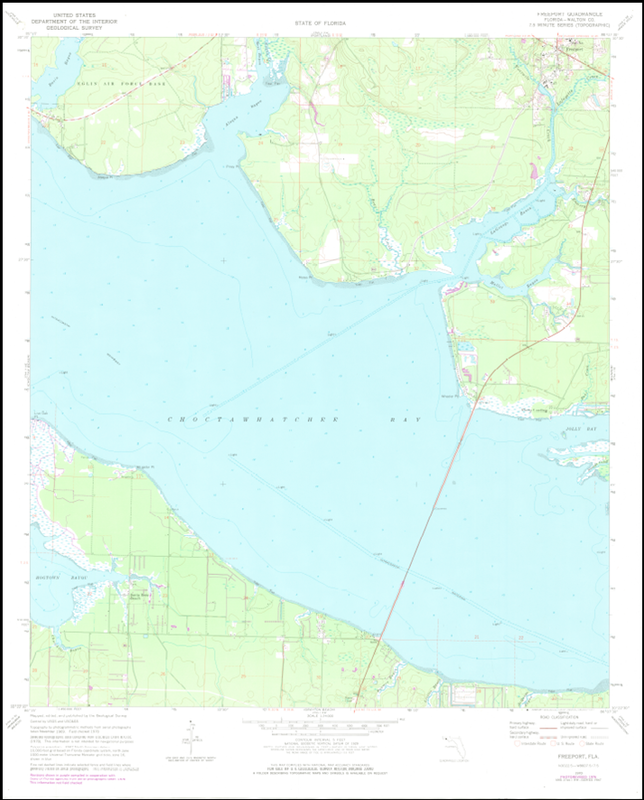 In the late 1960’s the United States Geological Survey (USGS) received responsibility from the Bureau of the Budget for the National Topographic Map Series of the United States. The assignment to the USGS is to accurately compile, reconcile, and display all known survey, topologic, and geographic data of the United States. To do this, the USGS develops and publishes area surveys known as Quadrangles. The USGS is required to utilize the original TRS surveys and field notes to extrapolate the original grid location, size, and shape using state of the art methods and technology. The USGS’s representation is based on Federal surveys of 48 sections from surrounding Townships and titled the Freeport Quadrangle. Near the bottom right corner and above the dotted line representing the section line, a road is shown with 4 dots to the south of the road. The second dot is our home which was built in the 1940’s. The section line is well south of the home, according to the USGS. The scale of the Quadrangle is not shown, but the USGS purports that 1/32 of an inch = 165 ft. Using this scale, the distance shown from our home to the section line is greater than 200 ft. The USGS survey alone is not definitive proof of the original location of the TRS grid on the ground at 1S 19W or any other Township. However, if this Quad had shown the section line north of our home or on top of our home we would have substantially less to base a reasonable argument on. The photo shown above is a close up the Walton County Tax Appraiser's website map shown to the right. 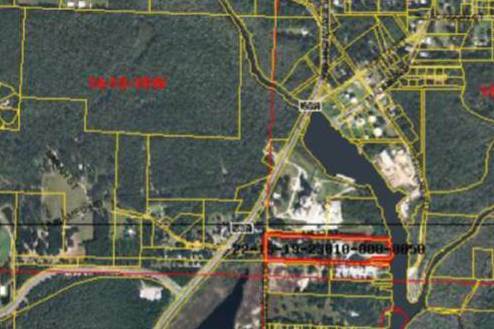 The yellow lines show the property boundaries according to deeds filed through the Walton County Clerk of Courts office. Descriptions to each deed is tied to the TRS grid of 1 South 19 West. The red line shown near the bottom is the USGS location for the south line of section 16. On the west side of Four Mile Creek, the bottom line of the rectangle highlighted in red is the new location of the south line of section 16 by order of the County Judge. The yellow line in alignment with the bottom line of the red rectangle. is the current section line used by the County, and runs through our home & business. Our property and adjoining neighbors show old established property lines and fences south of the yellow line On the east (right) side of the junction of Four Mile and LaFayette Creeks, the yellow line and subsequent property boundaries are more in alignment with the red USGS line. The Original Plat and Survey of 1826 clearly shows that there is no deviation in any section line within the Township. Does a County Judge have the authority move or relocate a Federal Section line? After the USGS surveyors came through the area in the late 1960's During the course of our research time, we were able to locate two assistants that worked with Horace Sheppard to do a survey of the area around the City of Freeport, We were able to find the archives of his work, which was purchased by another local surveyor. The archives are housed in a large room with lots of filing cabinets full of surveys. The survey and field notes for the job in the Freeport area were missing from the archives. Mickey Marse, the former mayor of Freeport, admits there was a survey done and he’s seen it at some time or other. He claims that he does not know where the document is now. A request for the survey was made to Mr. Clayton Adkins, the Attorney for the City. Mr. Adkins claims that unless the name of the person who ordered the survey is provided to him, he is unable to help locate the document in his files.